The sixth edition of the National Festival of Traditional Then singing will take place on May 12-14 in the northern mountainous province of Ha Giang, with the participation of artists from 14 provinces and cities nationwide. Then singing is a form of art combining literature, music and dance and has long been a religious and cultural practice of Tay, Nung and Thai ethnic groups in the northern mountainous region of Vietnam during special occasions, such as village festivals. This type of singing is always accompanied by dan tinh (gourd lute). 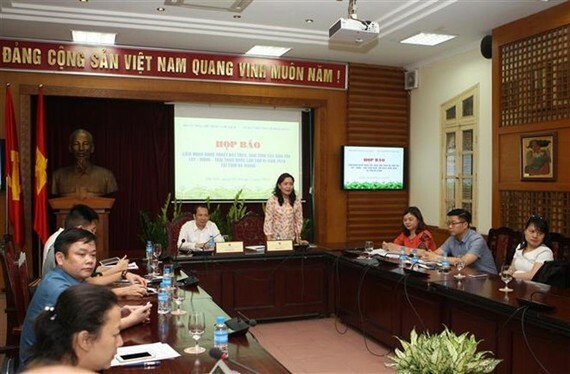 The festival aims to honour, maintain and develop the practice of Then singing and dan tinh performance in modern life, said Nguyen Thi Hai Nhung, head of the Department of Traditional Culture under the Ministry of Culture, Sports and Tourism at a press conference on the festival held on May 4. The event also offers chances for Then artisans and singers across the country to meet and share experience, she added. Art troupes from 14 provinces and cities where many Tay, Nung and Thai ethnic people reside such as Cao Bang, Ha Giang, Tuyen Quang, Bac Kan, Lang Son, Thai Nguyen, Bac Giang, Quang Ninh, Yen Bai, Lao Cai, Son La, Dien Bien, Lai Chau and Dak Lak, will perform different types of Then singing. The opening ceremony is slated for May 13 and will be broadcast live, while the closing ceremony will take place the day after. A series of sub-events will be held in the festival, including performances of Then singing in respective provinces and cities, a photo exhibition on Then cultural heritage and introduction of traditional weaving of Tay, Nung and Thai ethnic groups. Ha Giang province will also organise several activities to promote its tourism. Then singing is performed during significant events, such as prayer ceremonies for peace, good crops and good health, as well as to bring cheer and drive away sorrows. It is said to have originated in the late 15th century during the rule of Mac Dynasty. Legend has it that in Mac Dynasty, there were two kings who had special love for music and singing. They developed a handmade gourd lute called dan tinh and established two singing troupes to perform at the royal court. Ordinary people found it interesting and started learning it, preserving this form of singing till date. Last year, the Ministry of Culture, Sports and Tourism signed a dossier on then singing practice of the Tay, Nung and Thai ethnic groups of Vietnam for submission to UNESCO asking for the singing form’s recognition as part of the intangible cultural heritage.